Iran would be able to supply weapons to its allies in the region with the full blessing of the international community, because the nuclear deal being prepared in Vienna includes partial lifting of arms trade sanctions, a source close to the talks said. “The agreement states that the Iranians will continue supplying defensive weapons to its regional allies to fight against terrorism and extremism,” a source in the Iranian delegation told RIA Novosti. The UN Security Council passed a number of sanctions against Tehran over its controversial nuclear program, including those restricting its arms trade. 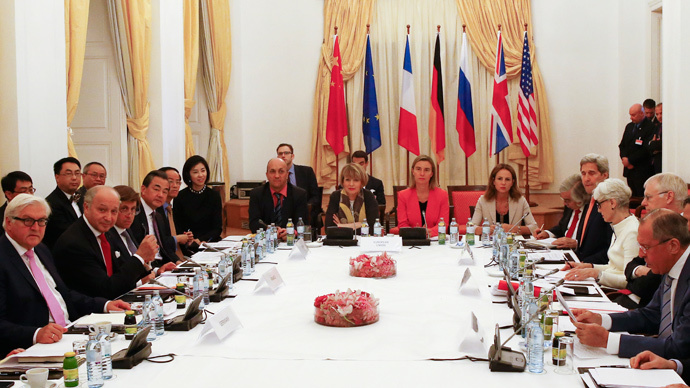 Iran andP5+1 group (the US, Britain, France, China, Russia and Germany)are finalizing a comprehensive deal that would lift those sanctions as well as those imposed by individual nations in exchange for scaling down the program and making it more transparent. Iran is believed to be secretly supplying weapons to a number of regional players, including the Lebanese militant movement Hezbollah and is accused of backing the Houthi Shiite rebels in Yemen. On Sunday, Iran’s nuclear chief Ali Akbar Salehi said that Tehran and six leading world powers have agreed on most technical issues and annexes to a possible nuclear deal. However diplomats say there are still stumbling blocks on the way to a final agreement. According to Reuters sources, the most difficult remaining issues in the negotiations are not technical, but political. UN access to Iran’s military sites part of deal? The draft agreement between Iran and six world powers includes a call for all Iranian sites, including military, to be accessed by UN inspectors, Reuters reported citing an unnamed diplomatic source. The report, which said the point is based on negotiations between P5+1 countries and Tehran, came after the end of what is said to be the final meeting of the countries’ foreign ministers in Vienna on Monday. The source also added that the text is still subject to change. A separate report by RIA Novosti cited a Western diplomatic source as saying that no mention of immediate sanctions relief is expected in the final document. The move would only be possible after “issues of former military dimensions of the Iranian nuclear program” are resolved. According to TASS citing a European source, after the deal is struck “restrictive measures will be frozen before the end of the year and during this time all the issues for their full lifting will be agreed upon.” A final announcement on the Iran-P5+1 deal is expected at about 10:30 am local time (8:30 am GMT) at the Vienna International Center, according to RIA Novosti.